PixelBerg brings realtime PBR to the C4D viewport and hardware render whilst also supporting lighting fast output with C4D standard render engine. Pixelberg whilst aimed mainly at the realtime artist is flexable enough to be used on a variety of projects. If you have not been living under a rock then chances are you have heard of PBR but what is it? PBR stands for Physical Based Rendering and means that the shading/lighting algorithms used are based on real world obsivations and physical properties allowing artists to create content that will be consistently high quality and predictable in many lighting scenarios. PixelBerg comes with its own PB material for physical based lighting calculations, Sky object for Image Based Lighting and also includes its own post FX's. These three systems all function together to produce outstanding realtime physical based visuals. PB has its own Physical based material that supports all major PBR workflows including Specular/Metalness and Roughness/Glossiness. PB primarly uses IBL and includes a handy gadget to create, postion and set the color of further directional lights(Often you will use at least 1 for the sun and shadows) at the click of a button. 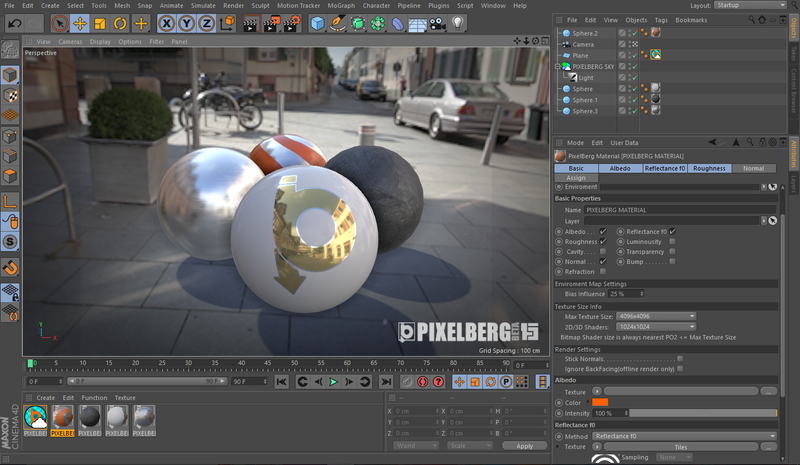 PB also supports/uses C4D standard lights and settings giving you complete control of lighting. PB Includes a host of POST FXs including Antialaising, SSAO, DOF, Tonemapping, Exposure, Contrast, Bloom, Lens Distortion, Vignette, Sharpen and Saturation with more being added in each release. PB is tightly intergrated into C4D so if you are using dynamics, morgraph or any standard C4D objects PB just works and provides instant visuals. If you like PB and want to help it develop why not opt to pay the RRP of $30 and get VIP member access which gets you a year of free updates and other bonuses. See here for terms and conditions of PWYW pricing. See here for benefits of VIP membership. Fixed Stability issue on Mac OSX with texture loading. Fixed issue with sky shadow density not working properly. Fixed shadows appearing on backface polys. Added an option for POM bump mapping to generate normal. Fix Bug Crashing on sky creating with high end nvidia GPUs. Added default Sky option (Setting a sky to default means that any materials without a sky link will use the default sky). Standard render post FX now done on GPU (massive speed up). Sky calculations improved providing better quality. Removed Sky Creation Tab as the sky maps are now created in realtime from a LatLong input map. Fixed graphic issue with older GPUs (hopefully Iris gpu too). Standard render now replaces original alpha channel as this is used for data during post fx calculation. SuperSampling AA added to Hardware render(use with care as renders at twice resolution and scales down) and viewport. Filmic Tonemapping Added and now default. Fixed bug with mapping (Tile,seamless) so viewport matches standard render. Added basic material converter PB<>C4d (not perfect because C4D materials are very flexible but should get you about 90% there in most cases). Tweaked watermark so it can be set as a scale to the output imagesize. Various other minor fixes and tweaks. R18 build added(*Removed R15 build due to R18 and plan to support last 3 C4D releases this may change if there is enough call for a R15 build). DISCLAMER: While great time and effort has been put into PixelBerg to ensure its usability and functionality it is important to remember that its is still in a beta stage and thus requires the following disclaimer: The software is provideded “as is”. I do not give any warranties, whether express or implied, as to the suitability or usability of the software. I will not be liable for any loss, whether such loss is direct, indirect, special or consequential, suffered by any party as a result of their use of the software or content. Use of the software is done at user’s own risk and the user will be solely responsible for any damage to any computer system or loss of data that results from such activities. Should you encounter any bugs, glitches, lack of functionality or other problems please let me know. VNT is a plug-in for C4D which adds a tool for creating and manipulating vertex normals on polygon objects in C4d. Virtually all other high-end 3d applications (3ds Max, Maya, ...) support vertex normal editing and while c4d supports importing and rendering vertex normals it lacks any interface or tool for creating or editing them. VNT aims to address that problem by giving the artist full control over vertex normals. Complete tool kit which adds the ability to really work with vertex normals on par with other high-end 3d software. Easily add new vertex normal tags to objects while preserving any phong angles and edge breaks. Built in functions for easily dealing with common vertex normals tricks. Steal or target another meshes normals. Bend Normal for special purpose like alpha plane hair, trees , grass, clouds etc..
VNT can help you achieve the desired results and is an incrediably usefull adition to any artists toolbox. If you like VNT and want to help it develop why not opt to pay the RRP of $30 and get VIP member access which gets you a year of free updates and other bonuses. Fixed bug in 17.048 AddColorChooser "#TypeError: Required argument 'settings' (pos 6) not found" does not seem to be documented but providing dummy bc seems to surfactant. I wanted to be fair with my pricing model and trust my fellow artists to pay what they see fit for my products. Frostsoft currently is very much a labour of love so please keep that in mind when deciding on the amount you wish to pay. Also it is worth noting that the more people who pay a fair price the more time i can spend developing current and new products. Suggested Price: A suggested price for the product you are free to pay more using the Your Price option. Minimum Price: There is a minimum price of $1 set by the payment provider that the system will accept. Your Price: Name your own price with the single caveat that it must be at least $1. Simply select which option you would like and complete the order. Users who pay the suggested price will recieve 12 months free updates and VIP access(please see VIP info below). If an update is released within 14 days of your purchase you will recieve the update free of charge. In the case of the above 2 exceptions and if you qualify you will recieve an email with download information within 48hrs of a new release if you do not recieve one please contact me with your original order number. As a way to say thank you to those who pay the SUGGESTED PRICE and to try and encourage more to do so when you pay the suggested price or more you will also get VIP member access. VIP members will recieve a link in there order to a special download area where they can download all of Frostsoft products (not just the one they purchased) together with any updates and pre releases. The link remains active for 12 months and any new products, updates or pre-releases will be uploaded there for them to download and use free of charge. Copyright Frostsoft 2013 All rights reserved,. Powered by Blogger.